Since the day Dr. Gunnin opened his doors for business, he has been providing his patients with the most advanced preventive, cosmetic, and restorative dental care available. Although his practice has grown over the years, he has never lost sight of the personal, individualized approach to dentistry that is his trademark. 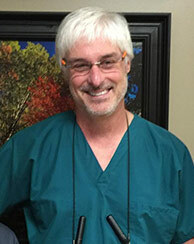 He strives to build a rapport with his patients and delights in being able to give them the smiles they deserve. Balancing experience, knowledge, and an exceptional chairside manner, Dr. Gunnin prides himself on providing truly gentle, state-of-the-art care for his patients. Whether you're coming in for a routine cleaning or a complex restoration, you can feel confident knowing that he continually researches the latest methods and brings you only those that give you greater comfort and better results. After graduating with a doctor of dental surgery degree from the University of Tennessee School of Dentistry in Memphis, Dr. Gunnin received advanced training in dental implant treatment, planning and restoration, and laser dentistry. He's studied at the world-renowned Nash Institute for Dental Learning and completed the Esthetic Epitome Continuum on cosmetic dentistry. An active participant with some of the most prestigious organizations in his field, Dr. Gunnin's professional memberships include the Academy of Laser Dentistry, American Dental Association, the World Clinical Laser Institute, the Academy of General Dentistry, the Tennessee Dental Association, the American Association of Seventh-Day Adventist Dentists, The American Orthodontic Society, and the American Academy of Cosmetic Dentistry.